Electronics Sales Associates sell electronic equipment and assist the customers in choosing the right electronic products. 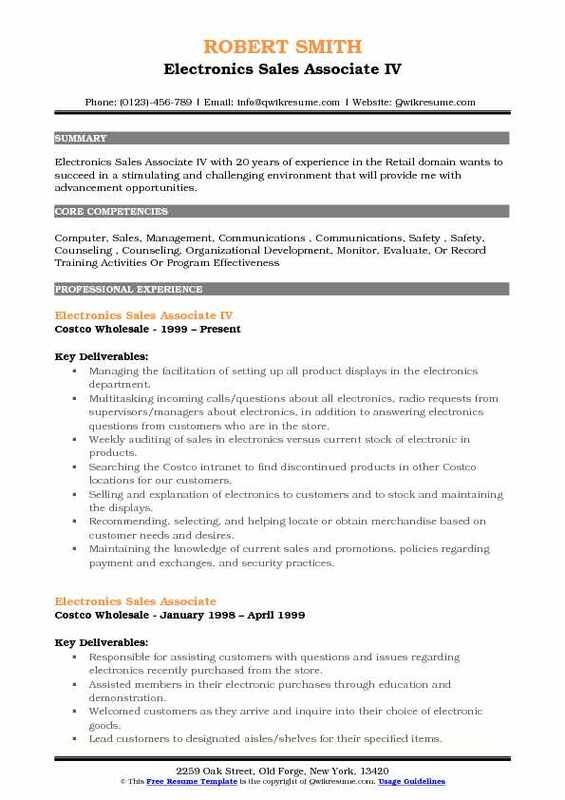 Responsibilities highlighted in Electronics Sales Associate Resume include welcoming and greeting customers, identifying the electronic requirement of the customer, making suggestions, describing the features of the product, offering ideas and advice, minimizing losses and managing quality inventory. These associates also have to feed the sales order into the database and keep track of orders until it is delivered and collect the needed feedback. 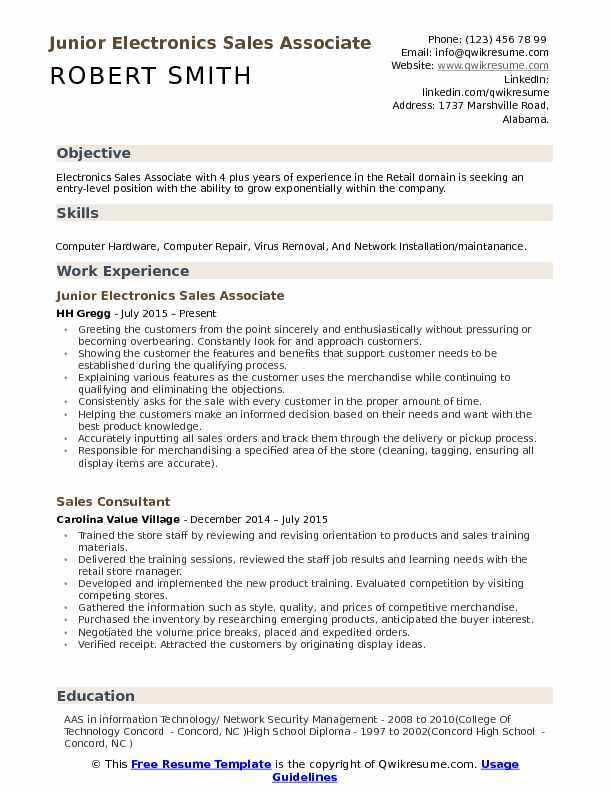 A Well crafted Electronics Sales Associate resume should demonstrate skills such as Electronics product insight, selling abilities, computer operations, proficiency in MS Office and aesthetically display electronics. Employers select an Electronics Sales Associate if they possess at least a High School diploma with familiarity in electronics equipment. 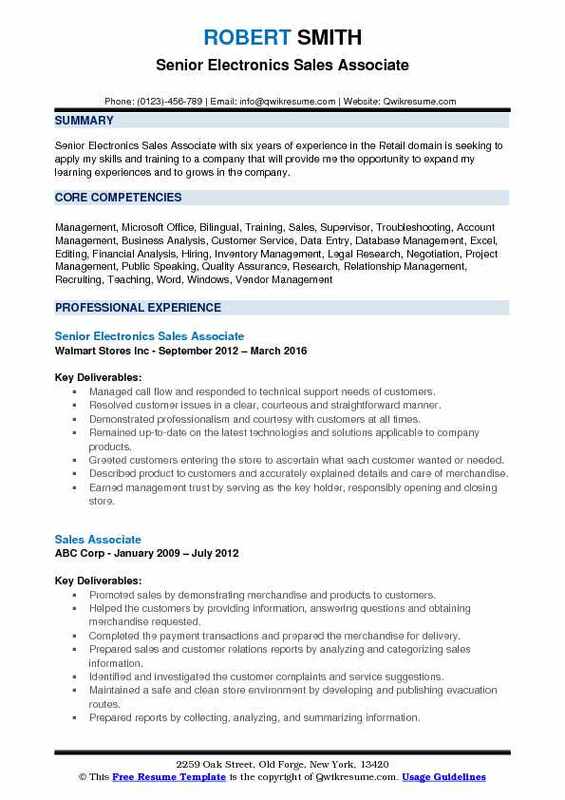 However, a resume that shows sales training certificates holds a major plus. 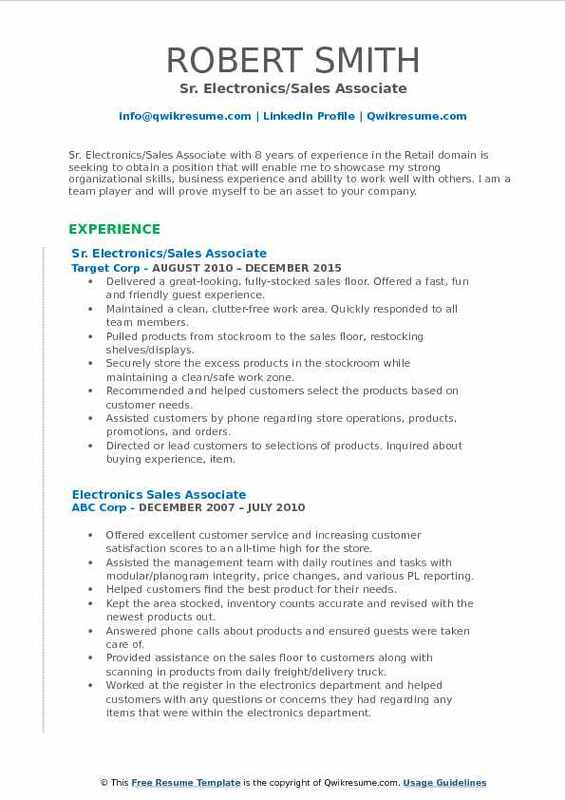 Objective : Electronics Sales Associate with 4 plus years of experience in the Retail domain is seeking an entry-level position with the ability to grow exponentially within the company. 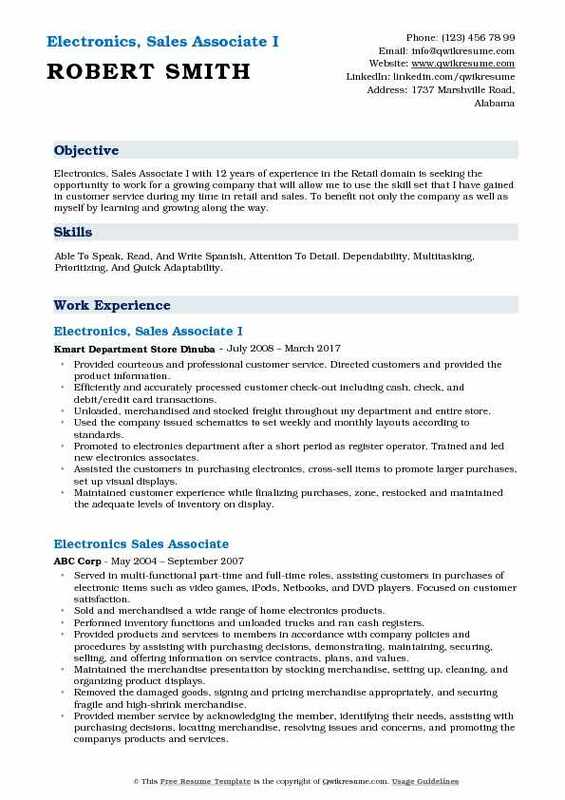 Skills : Computer Hardware, Computer Repair, Virus Removal, And Network Installation/maintanance. Greeting the customers from the point sincerely and enthusiastically without pressuring or becoming overbearing. Constantly look for and approach customers. Showing the customer the features and benefits that support customer needs to be established during the qualifying process. Explaining various features as the customer uses the merchandise while continuing to qualifying and eliminating the objections. Consistently asks for the sale with every customer in the proper amount of time. Helping the customers make an informed decision based on their needs and want with the best product knowledge. Accurately inputting all sales orders and track them through the delivery or pickup process. Responsible for merchandising a specified area of the store (cleaning, tagging, ensuring all display items are accurate). Responsibility-take responsibility for operations and sections when on the floor. Spending the extra time necessary to make sure the store is maintained properly before leaving a shift. 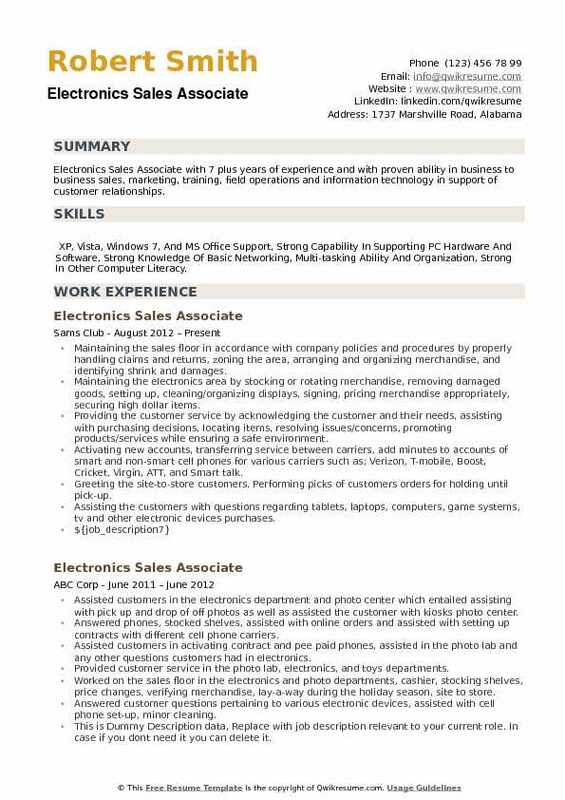 Headline : Senior Electronics Sales Associate with six years of experience in the Retail domain is seeking to apply my skills and training to a company that will provide me the opportunity to expand my learning experiences and to grows in the company. Resolved customer issues in a clear, courteous and straightforward manner. Demonstrated professionalism and courtesy with customers at all times. Remained up-to-date on the latest technologies and solutions applicable to company products. Earned management trust by serving as the key holder, responsibly opening and closing store. Effectively communicated with and supported sales, marketing, and administrative teams on a daily basis. Summary : Experienced Electronics Sales Associate III with 18 plus years of experience in the Retail domain is seeking new career opportunity. Excellent people, communication, and organization skills. Providing excellent customer service in the department and throughout the store, answering customers questions about products and services. Assisting the customers with understanding and purchasing wireless contracts. Processing the customer transactions at the cash register, accepting multiple types of payment and making accurate change. Having managed all aspects of fabrics, crafts, celebrations, and stationery department. Supervising up to six employees, providing guidance and task prioritization. Resolving customer service issues when possible and referred to the Supervisor when necessary. Merchandising the departments to showcase new items and remove older or expired merchandise. Implementing the price changes on a daily basis to ensure current sales prices were correctly displayed. Managing the other departments in previous positions, including personnel, toys, frozen food/dairy, pharmacy, and grocery. Summary : Sr. Electronics/Sales Associate with 8 years of experience in the Retail domain is seeking to obtain a position that will enable me to showcase my strong organizational skills, business experience and ability to work well with others. I am a team player and will prove myself to be an asset to your company. Delivered a great-looking, fully-stocked sales floor. Offered a fast, fun and friendly guest experience. Maintained a clean, clutter-free work area. Quickly responded to all team members. Pulled products from stockroom to the sales floor, restocking shelves/displays. Securely store the excess products in the stockroom while maintaining a clean/safe work zone. Recommended and helped customers select the products based on customer needs. Assisted customers by phone regarding store operations, products, promotions, and orders. Directed or lead customers to selections of products. Inquired about buying experience, item. Directly offered help to the department Manager over technology and electronics. Utilized AS400 skills to order products for merchandising, logging daily reports, and maintaining a balanced schedule for a team environment. Trained to acquire a service department of my own. Objective : Dynamic and results-oriented Electronics Sales Associate with 3 plus years of experience focused on advancing company goals by adapting to changing demands and business needs, while making timely and effective decisions. Committed to providing an outstanding customer service experience in accordance with the company's policies and procedures. Assisting the customers as needed with electronic and cellular devices and stocking shelves with freight and direct shipments. Running cash register both in the department and as needed at the front end of the store. Following the modular plans as needed, creating pick lists and pulling merchandise and assist in other departments as needed and maintaining a neat and clean work area. Establishing rapport with potential/current customers and identifying the customer needs and service requirements. Providing customer service to clients with technology and electronic inquiries. Maintaining all sales, inventory and auditory record accurately, working closely with department managers. Maintaining the merchandise presentation by properly stocking merchandise to provide maximum customer appeal. Providing the customer service by identifying customer needs so that customers feel that they have been dealt with professionally. Opening the electronics department and handled inventory for cell phones and accessories daily. 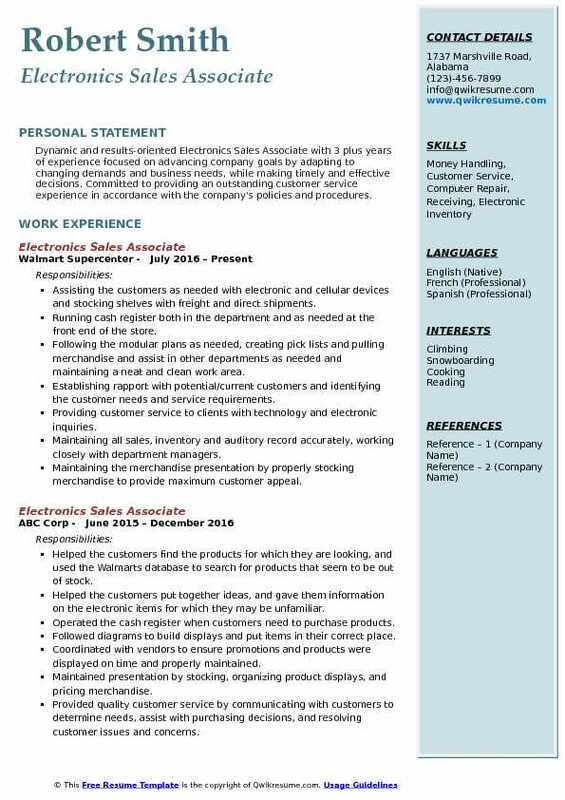 Summary : Electronics, Sales Associate I with 12 years of experience in the Retail domain is seeking the opportunity to work for a growing company that will allow me to use the skill set that I have gained in customer service during my time in retail and sales. To benefit not only the company as well as myself by learning and growing along the way. Skills : Able To Speak, Read, And Write Spanish, Attention To Detail. Dependability, Multitasking, Prioritizing, And Quick Adaptability. Provided courteous and professional customer service. Directed customers and provided the product information. Efficiently and accurately processed customer check-out including cash, check, and debit/credit card transactions. Unloaded, merchandised and stocked freight throughout my department and entire store. Used the company issued schematics to set weekly and monthly layouts according to standards. Promoted to electronics department after a short period as register operator. Trained and led new electronics associates. Assisted the customers in purchasing electronics, cross-sell items to promote larger purchases, set up visual displays. Maintained customer experience while finalizing purchases, zone, restocked and maintained the adequate levels of inventory on display. Accepted and tracked the deliveries, maintained the clean and organized department, answered department phones, and efficiently operated point of sale registers. Accepted payment for purchases, provided accurate change and provided exceptional customer service at all times. Engaged customers proactively to determine their needs and make recommendations. Summary : Electronics Sales Associate II with 15 plus years of experience in the Retail domain is offering versatile customer service skills and proficiency in sales. Flexible problem solver, who readily adapts to changing work environments, works independently and meets job expectations. Able to jungle multiple priorities and meet deadlines without compromising quality. Greeting and assisting the customers, receiving and displaying the new merchandise. Training new associates, assisting the management with special projects, fulfilling online orders in a timely manner. Demonstrating strong product knowledge along with accurately and efficiently process transactions. Trusted to provide training and support to all employees and management. Recently received employee of the month for going above and beyond for both customers and co-workers. Describing the merchandise and explaining the use, operation, and care of merchandise to customers. Recommending, selecting, and helping locate or obtaining merchandise based on customer needs and desires. Maintaining the knowledge of current sales and promotions, policies regarding payment and exchanges, and security practices. Helping the customers find the products that they want, as well as help to troubleshoot their needs. Giving advise as to what products would best serve their needs, all while providing exemplary customer service. Summary : Electronics Sales Associate IV with 20 years of experience in the Retail domain wants to succeed in a stimulating and challenging environment that will provide me with advancement opportunities. Managing the facilitation of setting up all product displays in the electronics department. Multitasking incoming calls/questions about all electronics, radio requests from supervisors/managers about electronics, in addition to answering electronics questions from customers who are in the store. Weekly auditing of sales in electronics versus current stock of electronic in products. Searching the Costco intranet to find discontinued products in other Costco locations for our customers. Selling and explanation of electronics to customers and to stock and maintaining the displays. Recommending, selecting, and helping locate or obtain merchandise based on customer needs and desires. Assisting the management with stocking reports, sales analysis, and assisted with the delegation of employee duties and tasks. Assisting the other departments with inventory, account reports, powerpoint presentations, and damaged returns. 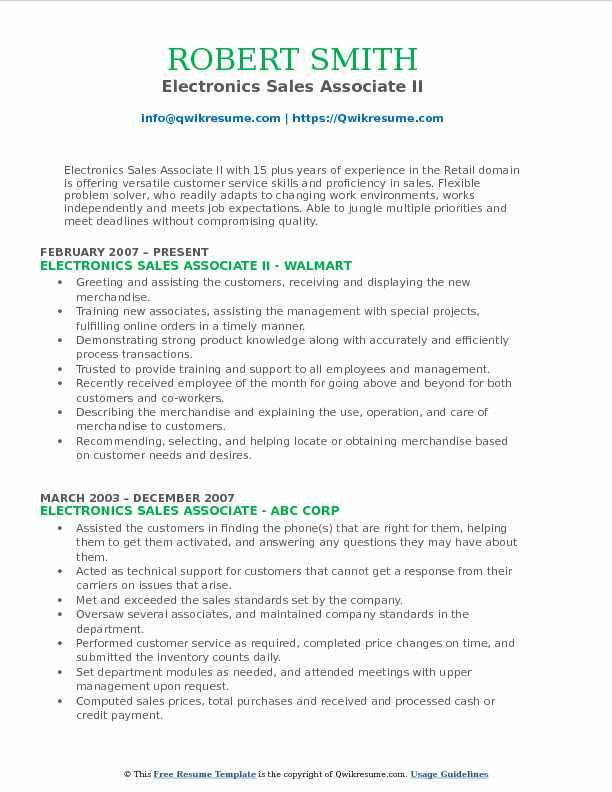 Summary : Experienced Electronics - Sales Associate with 15 plus years of experience in the Retail domain, adept at problem-solving, customer service and hiring and training hardworking, quality staff. Highlights Accurate cash handling Retail inventory management Store operations Outstanding communication skills Flexible schedule Reliable Store opening and closing procedures. Prepared displays of merchandise and relocated merchandise as needed. Ability to efficiently operate cash register, scanners and computers to itemize and total customer purchases. Also, collect credit card payments. Responded to or direct telephone and walk-in inquiries as appropriate and provide information concerning merchandise availability. Performed assigned responsibilities, duties, and tasks according to established practices, procedures, techniques and standards in a safe and efficient manner and with minimal supervision. Displayed a positive and helpful attitude on a daily basis toward customers and other associates. Helped the members and associates with their new cell phone activations and/or their upgrades for various carriers such as ATT, Verizon, and Sprint. Explained the products and services to customers concerning electronics and cellular devices. Occasionally processed inventory management and compiled necessary paperwork for the department. 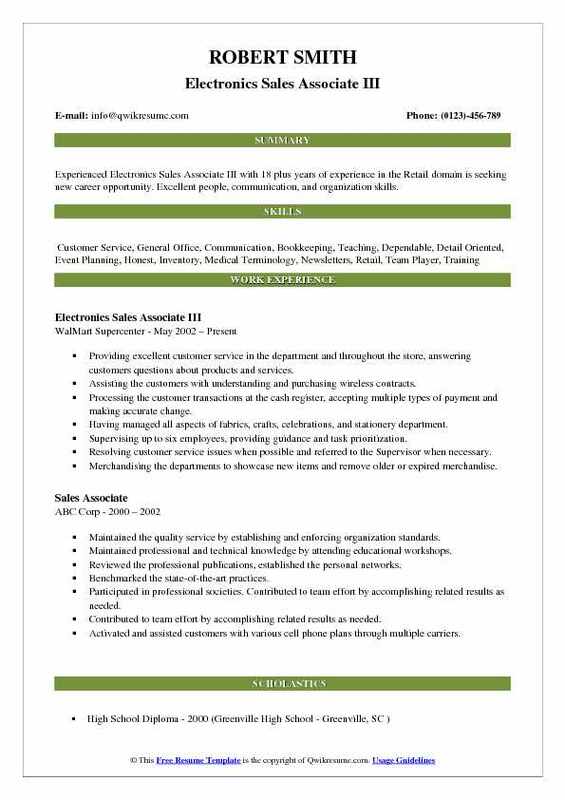 Summary : Electronics Sales Associate with 7 plus years of experience and with proven ability in business to business sales, marketing, training, field operations and information technology in support of customer relationships. 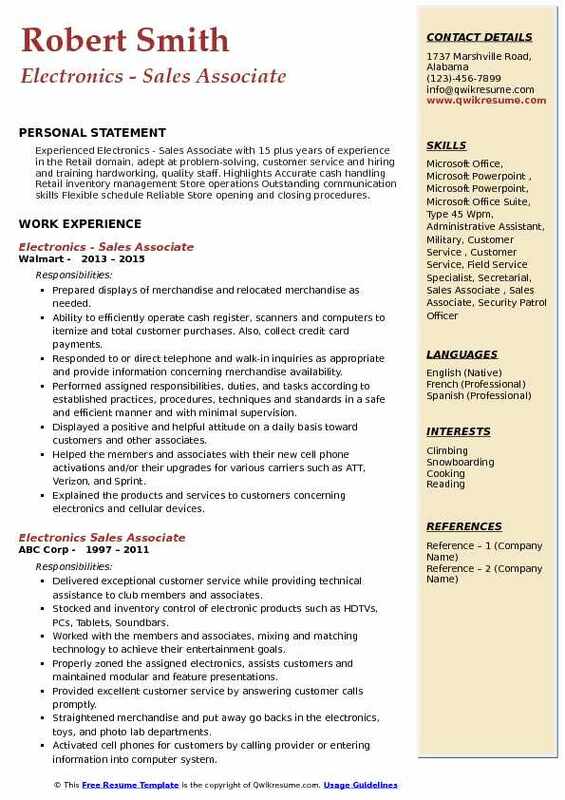 Skills : XP, Vista, Windows 7, And MS Office Support, Strong Capability In Supporting PC Hardware And Software, Strong Knowledge Of Basic Networking, Multi-tasking Ability And Organization, Strong In Other Computer Literacy. Maintaining the sales floor in accordance with company policies and procedures by properly handling claims and returns, zoning the area, arranging and organizing merchandise, and identifying shrink and damages. Maintaining the electronics area by stocking or rotating merchandise, removing damaged goods, setting up, cleaning/organizing displays, signing, pricing merchandise appropriately, securing high dollar items. Providing the customer service by acknowledging the customer and their needs, assisting with purchasing decisions, locating items, resolving issues/concerns, promoting products/services while ensuring a safe environment. Activating new accounts, transferring service between carriers, add minutes to accounts of smart and non-smart cell phones for various carriers such as; Verizon, T-mobile, Boost, Cricket, Virgin, ATT, and Smart talk. Greeting the site-to-store customers. Performing picks of customers orders for holding until pick-up. Assisting the customers with questions regarding tablets, laptops, computers, game systems, tv and other electronic devices purchases.